We would like to thank you for giving us the opportunity to show you our extensive selection of chandeliers. As World Class Lighting, we have been manufacturing high quality chandeliers for over 12 years covering the entire spectrum from 24Kt. Gold Plated Crystal Chandeliers to Alabaster Chandeliers. All of our fixtures are hand made in Europe by experienced craftsman for whom, making a chandelier is an art form that requires passion for detail, beauty and creativity. We want you to enjoy your chandeliers for many years to come . To assure that, we only use the best quality materials and workmanship. To show you that we have 100 percent confidence in the quality of our chandeliers, we are giving you a 10 year warranty on our chandeliers and a 30 day Money Back Guarantee. 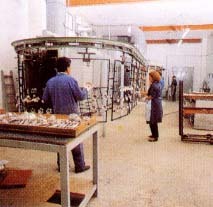 The majority of our chandeliers are made in our own factory in Valencia, Spain. The Murano chandeliers are made in Italy. The base material is very important in the quality of a chandelier. We prefer brass because it has excellent casting, polishing and electro-plating properties. We only use steel in our chandeliers where strength is needed or it is impossible to use brass. 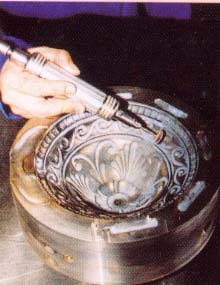 In the first step, brass is processed to make the parts of the chandelier. It is either cast by using molds that are hand made from high strength steel or stamped and spinned by hand in special lathes. The second process is to give brass the perfect smooth finish, which is also done by hand using polishing machines. 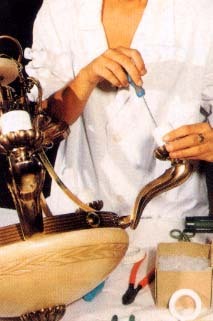 This is a very important process, which requires expertise and technique. 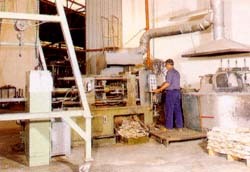 The third process is to give these parts the desired finish by using various methods. They include 24Kt. Gold Plating and chemical baths and patinas for antique finishes. To achieve high quality, these processes have to be controlled and monitored very carefully. For example, in electroplating, the chemical balance of the plating solutions and their temperatures are very crucial, a slight change can result in defective finishes. 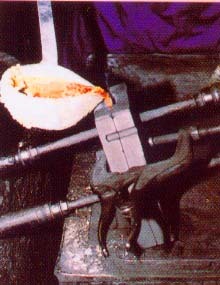 The fourth process is lacquering the finished parts. As you may know, brass will tarnish if not protected from outside effects. To keep the beauty of the chandelier, it has to be lacquered. 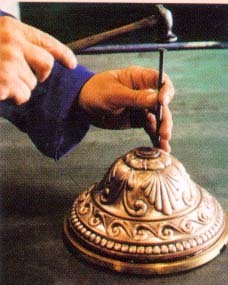 The lacquer we use is specially formulated for our chandeliers. It is very strong and all the parts have to be cured in special ovens afterwards so that they will have a very tough, clear coat that will protect the beauty of our chandeliers for many years. Once the parts for the chandeliers are finished, they go through our quality inspection to make sure that they are in perfect shape. Afterwards, they are assembled to complete the chandelier. All the electrical components and wiring in our chandeliers are U.L. approved. We can modify the electrical components of our chandeliers to fit the voltage requirements (220V) of your country at no extra charge. Once the chandelier is completed, it is packed very carefully to make sure that it will not be damaged during shipping. We ship all of our chandeliers insured to protect our customers against any damage. We have been shipping chandeliers all over the world, Japan, Australia, South America etc. We have contracts with major shipping companies that guarantees us excellent rates. If you would like to know the shipping cost of a particular chandelier, please give us a call and we would be happy to give it to you. To better assist you in choosing your chandelier, we are also offering a free 114 page catalog that shows hundreds of different models and a CD-ROM that has even more models and shows each one of them in great detail. Our goal is your total satisfaction and to achieve this we will custom make a completely unique chandelier just for you up to 20 feet in diameter. Just because it is custom made, it does not have to be very expensive. One of our most powerful advantages over our competitors is our flexibility in terms of custom designs combined with our low prices. We are your direct source for quality chandeliers at unbeatable prices. Don't take our word for it, please shop around and compare our prices, but make sure that you are comparing apples to apples. Your total satisfaction is our main objective. As the president of World Class Lighting, my pledge to you is to give you the best quality and service you rightfully deserve.